A section of the gathering. 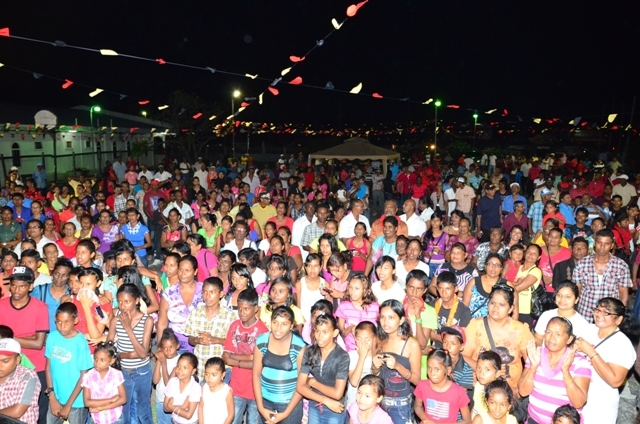 [www.inewsguyana.com] – As the People’s Progressive Party (PPP) celebrated 21 years in power on Saturday October 5 in Tain, Berbice Region Six, Former President Bharrat Jagdeo urged supporters to be ready for general elections anytime. In his remarks to those gathered at the University of Guyana Campus, Jagdeo warned that the Opposition parties have the majority in parliament, and they [opposition] have the power to take down the government at any point in time. As such, the Former President told the gathering to understand the struggle the country is currently experiencing. “We can’t have you just be a passive supporter anymore. You have to help us to walk the streets, because elections could be in four months’ time; they have the majority, they could bring us down anytime. We have to be ready every single day to contest an election. 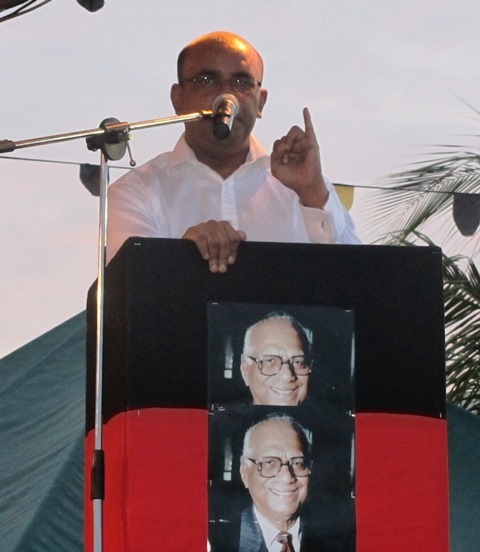 We cannot be caught flat footed,” Jagdeo said. In criticizing the main opposition – A Partnership for National Unity (APNU), Jagdeo said that the APNU is re – writing history by bringing in ‘players’ from the past. He accused APNU’s Leader David Granger of taking away the rights of Guyanese people during his tenure in the army. Additionally, Jagdeo criticized the leadership of APNU Member Carl Greenidge during his time as Finance Minister. “Greenidge’s history as Minister of Finance was the worst ever in Guyana. When Greenidge took office, the debt was US$600 million, by the time he left as Finance Minister, it had grown to US$2.1 billion and over that period, our country retrogressed instead of moving forward…” Jagdeo told the gathering. Meanwhile, PPP Member Gail Teixeira reminded the gathering of the hardships that the PPP endured over the years. She also accused the Opposition of working hand in hand with criminal elements. Also delivering remarks at the event was General Secretary of the party, Clement Rohee and President Donald Ramotar.